Chocolate mousse had it’s moment of glory in the 1970s. My preference was always for a small pot of dark dense intense mousse made with bittersweet chocolate, more closely related to a chocolate truffle than mousse. Reading the Margaret Fulton Cookbook from 1968 for the Cookbook Guru I came across this recipe for chocolate mousse without cream, with a shot of espresso added for a bitter twist. It was a call for me to revisit chocolate mousse. Most of this book has dated badly, but it is a snapshot in time, a valuable reflection of the Anglo Aussie food of my childhood. Thankfully we’ve moved on, embraced the cultural influences of our neighbours and friends, married their flavours and techniques to those we grew up with and created a free ranging Aussie cuisine unfettered by tradition. There are some recipes of note in this book though, a smattering of recipes that translate across the 50 years since it’s publication. You only need to look at the baking others have been posting on the Cookbook Guru to see the foundation of many of today’s ideas. I’ve tweaked this recipe a little in deference to my coffee habit and adjusted the method a tad for increased stability, but as it stands it’s a truly fabulous made in 10 minute dessert recipe. It’s walnut season so I topped the mousse with crushed candied walnuts for crunch! Chop the chocolate and put it into a basin with the coffee. Put the bowl over a pot of simmering water, melt the chocolate. Remove the chocolate from the heat and stir in to egg yolks one at a time. Beat the egg whites into soft peaks, then sprinkle over the castor sugar and continue whisking until the sugar is incorporated. This will stabilise the egg white. Lightly and thoroughly fold the 1/3 of the egg white into the chocolate. Fold in the remaining egg white. 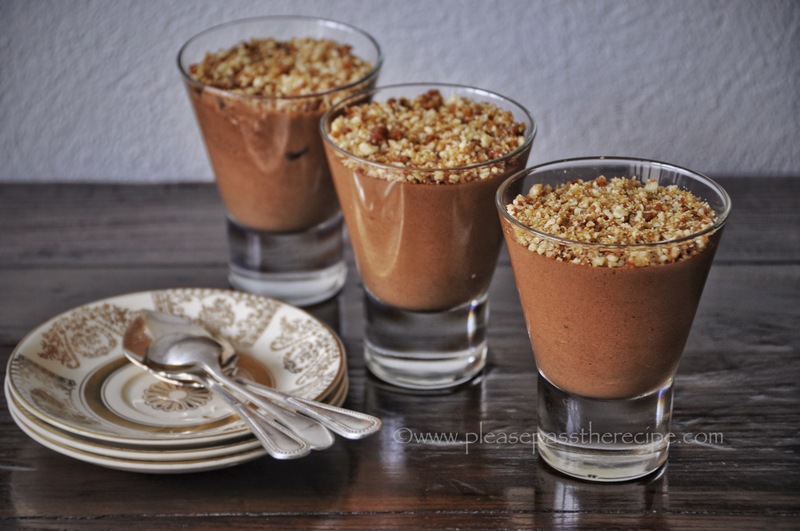 Spoon the mousse into individual serving glasses. I remember this recipe from my adolescence so well. I must have made it so many times. Grateful to find your post today as I wanted to cook it for some old friends. So thank you. You’re welcome. I made the mousse with my 9yr old grand daughter recently, just reinforced how brilliant the recipe is. Enjoy…..
Hi Kath, I’ve never tried 2 days ahead but if you made it tomorrow it would be fine Sunday. Enjoy…. yum chocolate mousse. still a good thing after all these years. i used to make it with whipped cream also and no coffee but i think the coffee is a fab idea. Anything chocolate is very welcome! This looks easy and can be prepared in advance – two big pluses. Love those candied walnuts. Thanks Debi, you’re right chocolate is always a big hit!! I prefer the denser version of chocolate mousse as well, although they’re both pretty fabulous! Love the candied walnuts idea! Classic indeed and very tasty. I love looking at old cookbooks – my mother has a series of Italian cook books from the 1970s and clearly food photography wasn’t big those days! The food looks totally unappetising (though many of the recipes are still ok). Margaret Fulton was such a legend – and the only Australian cook that was talked about back then (I have a vague memory of Peter Russell Clark though…). I think her grand daughter has a lovely cookbook that has just been released). Anyway the mousse looks terrific! Thanks Paula, it is good mousse, the espresso lifts the flavour a notch. I love old cookbooks for their social value. Did we really cook and eat that way? Thanks to your inspiration Margot, that line was grew out of something you said to me a month or so ago! How delectable and so beautifully presented! Yum! Thanks Fae, a lovely treat! I am not a dessert maker, or eater really, but this one may make me change my mind! Yum! Thanks Ann, it’s quick and simple and oh so delicious, worth the effort! Most of my early cooking was taken from Margaret Fulton’s books. I recall making her chocolate mousse many times, with great success. MF’s mousse is a recipe so good I understand you making over and over. I’ve been cooking from this book for 40yrs, can’t believe I’d overlooked it! OMG: we did not use the word ‘fusion’ in those days but were truly trying for tastes and origins different! Am not a desert maker but remember these ‘obligatories’ only too well!! OK – if we call ‘Margaret Fulton’ of the time ‘dated’ what about recipes we read all the way to that ultimate gourmand Henry VIII? Let’s cancel the ‘bad’ and keep the ‘good’ Have a wonderful Long Weekend!!!! I haven’t made chocolate mousse in years! It was my go-to dessert when I was 16-17 and mum was having a dinner party. SO GOOD! Sounds divine. I’ve always felt guilty about all that cream. This is guilt free chocolate mousse then! Looks fantastic. Chocolate at its best. Like this version with no cream, I will have to try it out. I love that one of the ingredients is espresso 🙂 A sweet little treat that looks delicious, thanks for sharing the recipe! Looks just scrumptious! Nothing like classic mousse 🙂 Like the addition of crunchy topping, always good to have a little texture with custard! I’ve always made her version, without cream, it stands up well go the French version. Like your tweaks. OMG Chocolate mousse. What could be better? Glenda this is THE best mousse, no cream, the tiniest amount of sugar, pure chocolatey pleasure!! Beautiful photos Mrs R. A treasured part of our culinary tradition, loving the crushed candied walnuts. Thanks Cheery, it’s easy to put your heart and soul into something you know will be delicious to eat once the photos are taken! yep, THE most important too!!! 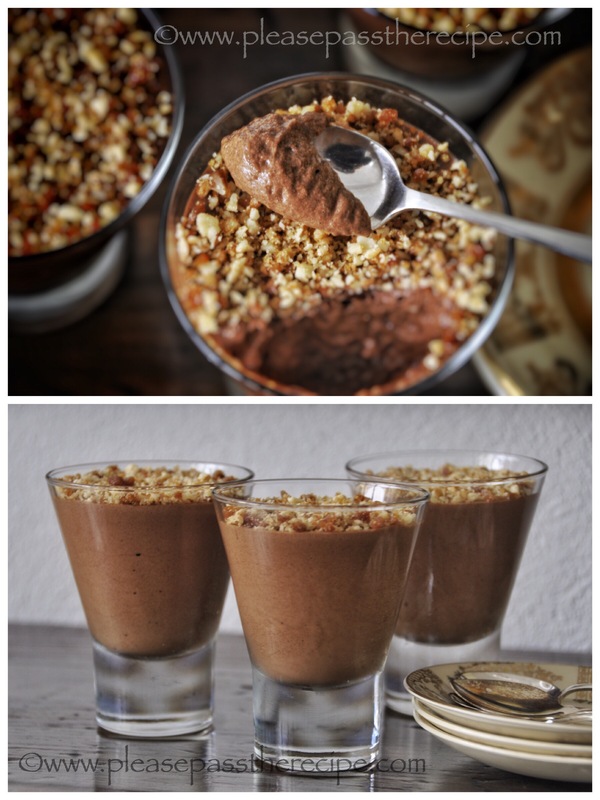 Chocolate….Mousse… do I need to say more to get you reading this post by Lady Red Specs as part of this month’s The Cookbook Guru? An excellent example of why sometimes the old school recipes are still great. I know I’ll be asking for a remake next time Lady Red Specs is visiting. This entry was posted on June 4, 2015 by ladyredspecs in Dairy Free, Desserts, FODMAP diet, Food, Gluten Free, Lactose Free, Light dessert, The Cookbook Guru and tagged chocolate, dessert, Fodmap, lactose free, mocha, mousse, quick dessert.